The island of Delos, the birthplace of Apollo and Artemis in Olympian Greek mythology, is one of the most important mythological, historical and archaeological sites in Greece. The excavations on this island are among the most extensive in the Mediterranean.The Terrace of the Lion was dedicated to Apollo by the people of Naxos shortly before 600 BC. It is estimated that between 9 and 16 lions were positioned along the Sacred Way, creating a monumental avenue comparable to Egyptian avenues of sphinxes. With their mouths open in a silent roar, they were set to inspire a divine fear to the worshipers. 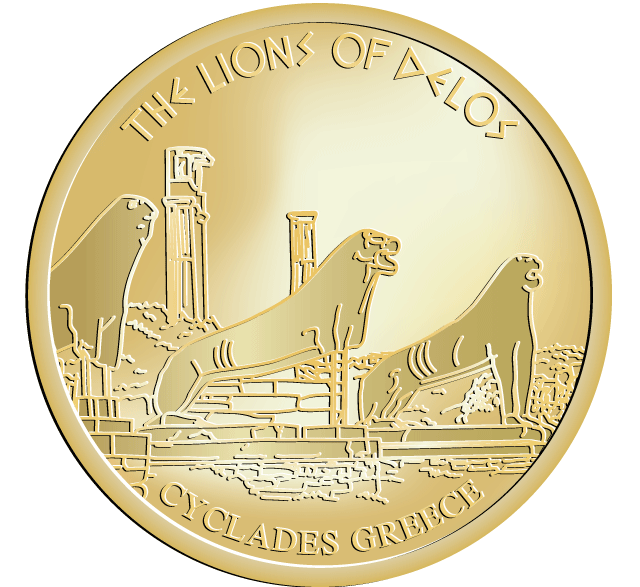 The lions were found between 1886 and 1906, but only in 1999 they were moved to the Archaeological Museum of Delos, after the wind and sea water damaged the surface of the sculptures for almost 100 years after their excavation. Only 5 lions survived and from 3 other lions only fragments exist, while another lion was transported to Venice. 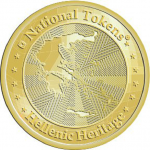 The coin is available at Mykonos.